We left for Bali this morning on the 10:40am flight with Air Asia. The plane is much smaller, just like the plane from Vietnam to Jakarta. The flight is very short though, lasting under two hours total, and the view was pretty sweet. There is a reason tourists from all over the world come to Bali for a fun time at the beach… this place is truly a paradise on Earth. There big mountains, and beautiful, green countryside everywhere, and the language, in my opinion, is truly awesome. I can’t understand a word of it, but just like Vietnamese… I love listening to it anyways! It was a good laugh for us all. Apparently when Gabriella (name starting with a G) organized everything, she told them my name “Charlie.” When asked the name, she said her name was Gabriella, but they pretty much interpreted that as the last name of the part involved. 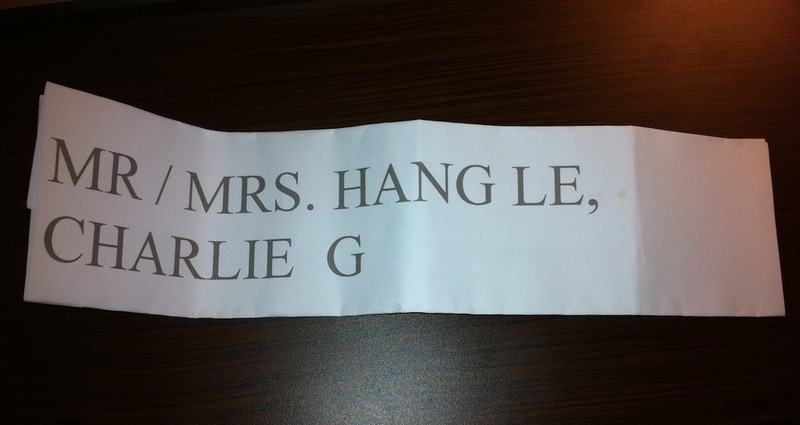 Therefore, I became “Charlie Gabriella” I think… it’s pretty funny. The man is actually our driver. In Bali, we have a driver who is essentially tied to us for ten hours per day, and he does nothing but drive, wait around while we do our thing, and then drive some more. He’s actually a pretty cool guy, and for the cheap rate of $65USD per day, I’m really grateful we have him around. It’s especially weird since they drive almost as nuts as in Vietnam, and they drive on the LEFT SIDE OF THE ROAD here as well. He also served as a sort of tour guide as well, telling us about certain landmarks and statues around the city. We went to a temple with monkeys, which was pretty cool, and he sorta walked with us and guided us around that place for a bit too. We arrived at our hotel, which in this country is rated as a 3-star hotel. Personally… this place got shafted on the ratings. It’s a really beautiful place, and the people are really awesome when it comes to service. We even received complementary Mojitos when we checked in! Nice! At night, we ate dinner by candlelight on the beach. The restaurant literally has a bunch of tables and chairs all set up for serving dinner on the beaches shoreline. We enjoyed all fresh fish, shrimp, clams, and squid as we sat in the sand under the stars. It was pretty cool. It was very cheap too, totaling only RP 284.000 (Rupiah), which equals roughly $34USD. That’s an amazing deal for all fresh food (which totally makes Red Lobster look like a McDonalds). Now we’re back at the hotel, and we’re about to go to bed. Tomorrow is going to be another awesome day, and it’ll be wonderful to get out into the sun again! Next story Walking Sales People Annoy the Crap Out of Me! Previous story Leaving For Indonesia Tomorrow! OK…..I am officially jealous!!! Looks and sounds beautiful! And I have NEVER received a free Mojito anywhere! I would also like to have a driver/tour guide for $65/day! How awesome is that! Love to both of you and continue having a wonderful time. Look forward to reading more!